Senior forward Joey Calistri fights for the ball. NU is looking to keep up its momentum going into its game against DePaul. The recent development of a strong defensive identity has Northwestern feeling confident entering a stretch of six consecutive games in the Chicago area. The Wildcats (4-4-1, 2-2-0 Big Ten) blocked 14 shots, coach Tim Lenahan said, in their 2-1 overtime victory against Maryland on Friday — their third straight game conceding just one goal. With a road match just down the El tracks at local rival DePaul (1-9-0, 0-2-0 Big East) looming on Wednesday and four home games (three of which will be played at Toyota Park) directly after, NU’s defense hopes their recent run of good form will translate into the second multi-game winning streak of the season. Senior defender Henry Herrill echoed Schnitman’s sentiments. Herrill and junior Nathan Dearth have both started all nine games to date on the back line, while Schnitman has started eight but appeared in all nine. Although the trio was joined by freshman defender Jake Roberge, making his first career start Friday, the collective experience of and consistency within the unit has paid dividends. “They’ve done a much better job … laying their bodies on the line when necessary — taking grenades, as we say,” Lenahan said of the defense. Although the win over then-No. 13 Maryland was crucial, Lenahan wants the team to understand there is still much more to achieve this year. Lenahan pulled out an annual trick following Friday’s rousing win, telling the team, tongue-in-cheek, to turn in their equipment and assemble for an end-of-year meeting. The “second half” begins with a Wednesday noon game at DePaul, a team Lenahan as well as the team’s veterans warn is far more dangerous than their near-winless record suggests. In their most recent match, the Blue Demons lost admirably 1-0 on the road against an undefeated Creighton team ranked No. 1 in the nation. 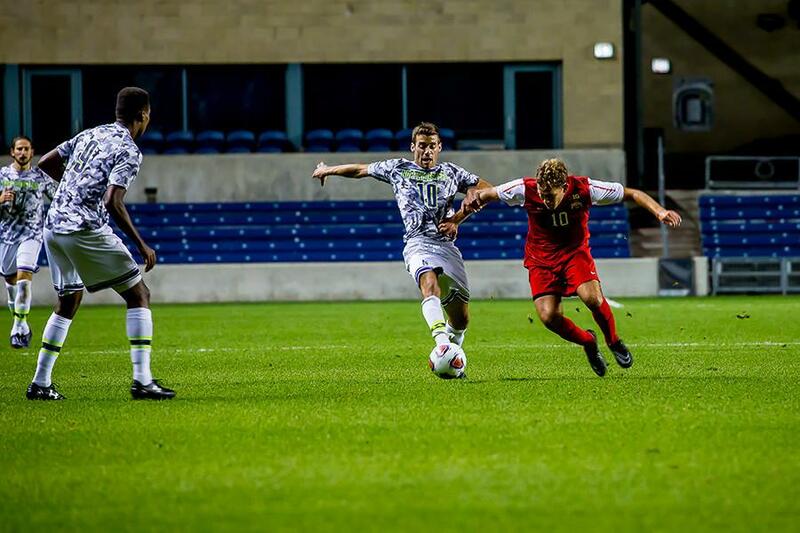 The Cats were routed, 5-0, by Creighton in an August exhibition match. Wednesday’s meeting between NU and DePaul will be the seventh consecutive year the two programs have squared off in a regular season matchup, with the previous six contests split at three wins apiece. The Cats have won back-to-back games in the derby, both by 1-0 scorelines, and hold a 16-9-1 advantage in the history of the matchup, but Lenahan also recalls a 4-0 beat down that his team suffered in another matinee match against the Blue Demons in 2011. Herrill, who was a freshman when NU’s eight-game winning streak to begin the 2012 season ended with a 2-0 home loss to their Purple Line rivals, emphasized how much the game means to both schools. Correction: An earlier version of this story misstated when Northwestern played Maryland. The game took place on Friday. The Daily regrets the error.